Making an impossible dream a virtual reality. While England anthem Three Lions clings to the hope that, one day, maybe, they could win the World Cup again, most Scots have reconciled with the fact that we never will. It’s in our national character to be pessimistic, and let’s be honest, realistic. 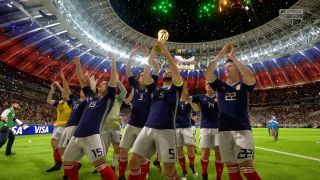 But anything is possible in videogames, and when I read about the new World Cup update in FIFA 18, I decided to create an alternate timeline where Scotland defy the odds and lift football’s most prestigious trophy. The free World Cup 2018 update is out now and features all 12 official Russian stadiums and the 32 teams who qualified for this year’s tournament. But you can play as countries that didn’t qualify, including Scotland, as long as you create a custom tournament rather than playing in the main World Cup mode. You get the same authentic Russia 2018 branding and atmosphere, but you get to choose the nations who qualify at the group stage. Scotland winning the World Cup is basically fantasy on par with Lord of the Rings, but I love that I can get a fleeting taste of it through the prism of videogames. Getting to the final did require some difficulty tweaking, but thankfully FIFA lets you fine-tune the AI. There were a few false starts, but I eventually got it so that the matches were a satisfying challenge, but I still had some chance of winning against much better teams. I start in group A with Japan, Portugal, and Iceland. England are in group E and I’m already excited about the prospect of facing our mortal enemy later in the tournament. Scotland’s stats in FIFA are unremarkable, with 75 ATT , 74 MID, and 74 DEF, but we have a few reasonably strong players including Celtic striker Leigh Griffiths and West Brom winger Matt Phillips. My first match is against Japan. Tom Cairney scores at 14 minutes, skimming one just under the bar. Then John McGinn scores at 50 minutes with a sloppy shot that Masaaki Higashiguchi nevertheless fumbles and lets roll in. The game ends at 2-0 and Scotland are off to a comfortable start. Next up, Portugal. Despite the intimidating presence of Cristiano Ronaldo, Stuart Armstrong crosses the ball to Cairney in the box, who scores with a spectacular header at ten minutes. André Silva sneaks the ball away from Charlie Mulgrew and equalises at 38 minutes, but the match ends 3-1 after a pair of late-game goals from Griffiths and Phillips at 82 and 90 minutes. The final match of the stage is against Iceland. Gylfi Sigurðsson breaks through my defence and scores at 16 minutes, but Griffiths retaliates with a lucky goal in off the post a few minutes later. It’s 1-1 at halftime and Iceland stirs the crowd up with some viking clapping, but Cairney slams another cross from Armstrong in at 76 minutes, securing Scotland’s place at the top of the group. We’re into the knockout stage now and I’m disappointed England didn’t make it through, because I won’t get to thrash them. The matches scheduled for the round of 16 include Poland vs. France, Belgium vs. Nigeria, Argentina vs. Iran, and Scotland vs. Russia. To reflect the opposition getting tougher I tinker with the CPU sliders some more to give the AI a bit more of an edge. Things start badly at 11 minutes when James Forrest gets a yellow card for tackling Dmitri Kombarov a little too aggressively. For around 40 gruelling minutes I struggle to keep hold of the ball as Russia’s defence tightens up. But Armstrong manages to slip through and chip one over the keeper. Russia seem to lose momentum in the second half, but the game doesn’t get any easier. Armstrong crosses the ball to Griffiths at 71 minutes, but Igor Akinfeev lunges and makes an extraordinary save. His luck doesn’t last, though. At 89 minutes, Akinfeev punches the ball away after a bungled shot by Griffiths, but Phillips catches it on the rebound and scores. 2-0 Scotland. For the first time in history, Scotland have reached the quarter finals of the World Cup. Belgium and Argentina won their games in the last round, so they’ll face each other next, and I’ll be playing Poland in the newly built Nizhny Novgorod Stadium for a run at the semi finals. Elsewhere, Brazil face Germany and Colombia go up against Spain. Things are getting tense. Robert Lewandowski catches my defence off guard at 14 minutes and scores a screamer from the edge of the box, leaving me feeling pretty stupid. But I fight back with a nudge past the keeper from Phillips at 63 minutes, and header from Griffiths at 73 minutes, putting Poland firmly in their place. Belgium beat Argentina in the quarter finals, so we’re up against them next. If we win, we’ll be facing either Germany or Spain in the final, both of whom should put up a good fight. Since this match decides who gets a shot at the trophy, I knock some of the CPU sliders up, giving Belgium’s AI a touch more shooting and passing speed. I don’t want this to be too easy. The whistle blows at the Saint Petersburg Stadium and the match gets underway. Nothing much happens in the first half, until Phillips take a shot, foolishly attempting to chip the ball over the head of the six-foot-six Thibaut Courtois. He saves it easily and it’s 0-0 at halftime. I decide to play more aggressively in the second half. Phillips makes up for his earlier blunder at 55 minutes by heading in a perfectly placed cross from Forrest. Then, at 86 minutes, Callum McGregor makes a mad dash down the wing and crosses to Armstrong, who sticks the ball neatly in the top-left corner and secures our place in the final. History has been made again. Germany are through to the final after beating Spain, and I make one last adjustment to the CPU sliders to make sure I have to actually fight for this victory—but not too hard, because I actually want to win the damn thing. The final takes place at Luzhniki Stadium and the gleaming World Cup trophy sits tantalisingly on a pedestal as the teams run out to play. At 15 minutes, Forrest slips through the German defence and aims a short pass at Armstrong, who’s near the keeper and doesn’t have to work hard to poke it into the net, giving Scotland an early lead. But disaster strikes in the second half when Forrest takes Lars Stindl down in the box with a reckless slide tackle, earning Germany a penalty at a crucial point. Stindl takes the penalty and the crowd goes wild when it hits the crossbar and bounces back into play. Phillips takes control of the ball and quickly clears it, dashing Germany’s hopes of equalising. The referee rightly gives Forrest a red card, meaning we’re now down to ten men. But it doesn’t phase us. Griffiths knocks one in past the keeper at 67 minutes, then another at 79 minutes. Germany fights back, trying desperately to regain control of the match, but they’re only playing for pride now. The final whistle blows and it’s official: against all odds, the Scotland team have destroyed the world’s best players and won the Russia World Cup 2018.